Copyright © 2013 Don H. Meredith, All Rights Reserved. The only time I ever saw woodland caribou in the wild of Alberta was when I was hiking in northern Banff National Park. I saw some animals crossing the alpine tundra several hundred metres ahead of me. Using my binoculars I confirmed they were indeed caribou as they disappeared from view down a rocky ravine. Little did I know that within 20 years, this herd would be gone forever. The caribou is an iconic Canadian animal, along with the beaver, polar bear and wolf. Indeed, the caribou haunts many a northern tale and is fundamental to the culture of aboriginal people living in the north, including supplying food and clothing. Biologists classify all caribou in the world as a single species, Rangifer tarandus, of the deer family (in Europe, caribou are called “reindeer”). In Canada, there are two distinct groups of caribou: 1) those that live in the tundra of the Arctic, which include the subspecies: barren-ground caribou, Rangifer tarandus groenlandicus, and Peary caribou, R. tarandus pearyi; and 2) those that live in the woodlands of the boreal forest and some of the mountains of British Columbia and Alberta, the subspecies woodland caribou, Rangifer tarandus caribou. Each of the groups has populations that are classified “at risk” by the Committee on the Status of Endangered Wildlife in Canada (COSEWIC). For example, the Peary caribou—the smallest bodied subspecies—is classified as “endangered” of becoming extirpated or extinct through much of the high Arctic. The barren-ground caribou is a subspecies of “special concern” through much of its range because it may become threatened or endangered as a result of a combination of its biology and certain identified threats. COSEWIC classifies the woodland caribou as “threatened” across much of its range because it is likely to become extirpated or extinct if something is not done soon to reverse the threats to its existence. Alberta only has populations of woodland caribou. The largest numbers are found in the northern third of the province, roughly from Cold Lake, Swan Hills and Peace River north. These populations are classified as “boreal” woodland caribou. “Mountain” woodland caribou are found in the mountains and foothills of the Rocky Mountains, from Jasper National Park through the Willmore Wilderness and north. Mountain caribou differ from boreal in that mountain caribou regularly migrate from summer to winter ranges in the mountains and foothills. All these populations are considered threatened with extirpation by both COSEWIC (under authority of Canada’s Species at Risk Act) and Alberta’s Endangered Species Conservation Committee (Alberta’s Wildlife Act). Why? 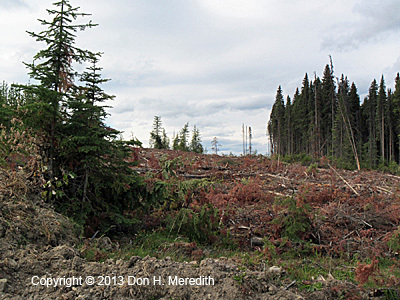 Small blocks of mature timber are not sufficient caribou habitat. As outlined in the 2010 update of the Status of the Woodland Caribou in Alberta (available through http://srd.alberta.ca/FishWildlife/SpeciesAtRisk/), woodland caribou are closely associated with large tracts of upland old-growth forests and peatlands where conifer trees dominate. These large spaces of dark woods supply the animals with lichens, their chief food source, and provide refuges from predation. Deep snow in winter in these areas and the fact that other hoofed animals (such as moose and deer) in these regions are more numerous but do not use these habitats, cause wolves and other predators not to frequent these habitats. However, from a forester’s point of view, these old-growth forests are not very productive and are often logged to encourage growth of younger, faster growing and more economically important tree species. As well, forest and petroleum companies break up these habitats with roads, pipelines and developments that maintain corridors into caribou habitat. Moose, deer, wolves and bears follow these corridors, exposing the caribou to increased predation. The caribou reproduction rate is generally lower than other species of the deer family, with females typically not reproducing until three-years old. Although pregnancy rates are high, calf survival rates can be low depending on many factors, especially predation. If too few calves survive to adulthood to replace those adults that die, then the population declines. In summer, woodland caribou eat a variety of plants, including grasses, shrubs and lichens. However, in winter, their main diet consists of a variety of ground and tree-dwelling lichens. This restricts them to what remains of the old growth and peatland forests where these lichens are most abundant. Studies in Alberta using radio telemetry have shown that predation is responsible for at least 50% of caribou mortality. Although other predators such as bears, coyotes and cougars play a role, wolves are responsible for the vast majority of the predation. Other mortality factors include such natural causes as starvation, disease and bad weather. Human caused mortality includes aboriginal subsistence hunting, vehicle accidents and poaching (sport hunting of caribou in Alberta has been prohibited since 1981). Woodland caribou are difficult animals to count. Traditional aerial surveys for ungulates don’t work because the animals live in dense bush and their low numbers are sparsely distributed in clumped groupings. In other words, it’s very easy to miss large numbers of animals. In the past, population estimates were based on observations of hunters and others and the loss of critical caribou habitat. However, in the last 20+ years, Alberta has conducted extensive monitoring of caribou populations in the province using radio collars that broadcast information about caribou locations and movement. As of the 2010 status report, the government has adequate population information for 13 of the 16 populations remaining in the province. Of those 13 populations, 10 are declining in number. These 10 occupy 83% of caribou range in Alberta and represent 70% of the estimated number of caribou in the province (estimated at less than 1000 animals). More caribou populations are now in sustained decline than was reported in the original status report published in 2001. Indeed, since that time the Banff population declined to extirpation in 2009. Of the three populations that are relatively stable in the province, two are being kept stable—at reduced numbers—through an expensive and controversial wolf eradication program: the La Peche mountain population (northern Jasper N.P. and the Willmore Wilderness) and the Little Smoky population (east of the La Peche population). The Yates population (north of the Caribou Mountains and extending into the NWT) is the only monitored population that seems to be stable in the absence of predator management. Indeed, the recent approval of the Dover oil sands project in northeast Alberta, where the proponent admitted two populations of woodland caribou would be sacrificed to bring the bitumen into production, illustrates the government is not prepared to conserve this threatened species if it means slowing down the frenzy to develop the oil sands as fast as possible. Yet, the government wants to maintain the appearance of concern for the caribou by authorizing the same predator control program in the area it has for the La Peche and Little Smoky populations. Do they really believe we are that stupid? 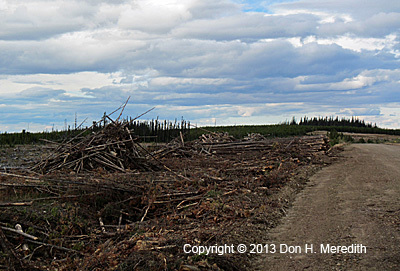 Large-block clear cutting does not preserve caribou habitat. The poisoning and shooting of wolves from the air might be a necessary short-term solution to preserve vulnerable caribou populations. However, it will not work in the long-term if habitat is not protected! To me, it is fundamentally and ethically wrong to violently condemn one animal living its life because of our negligence in protecting another from our greed. How long are we going to continue this shameful charade? This entry was posted in Alberta, Alberta Outdoorsmen, Canada, Conservation, Politics, Wildlife and tagged aerial shoot wolves, aerial shooting, boreal caribou, boreal woodland caribou, Brion Energy, caribou, COSEWIC, Dover Project, Fort McKay First Nation, habitat destruction, La Peche herd, Little Smoky herd, mountain caribou, mountain woodland caribou, oil sands, predation, predators, Rangifer tarandus, Rangifer tarandus caribou, species-at-risk, tar sands, threatened species, wolf poisoning, wolves, woodland caribou, woodland caribou status. Bookmark the permalink. Nice writeup Don, sure enough the plight of nature that cannot protest its destruction need a voice, and thanks for highlighting. Humans, take non rejection as an invitation but beware the collective wrath of Nature when felled upon humans, which are becoming evident leaves no room to hide. The sad part is one or two generation/s does the crime and generations to follow have to pay. I am emotionally attached to the cause and will be available in Edmonton, AB for any action required.